i am very happy to say and officialy announce the details for this years event. it will be held on 15th, 16th and 17th november 2019 at the same venue. the Grand hotel (formerly the Hilton) north shore. blackpool FY1 2JQ. friday 15th. evening film show. 8pm start. all welcome. saturday 16th. evening meal.quiz.film show.and the excellent raffle. sunday 17th. convention with film shows,auction,bring and buy.and of course many dealers selling films and equipment galore. 8mm 16mm 35mm. admission to convention has been held at last years price. just £6.00. doors open 10am. table enquires to Elaine Guest on 07931 457817.
for booking rooms at hotel contact Kerry Eastwood 01253 627977. mention you are attending film fair when booking. lets make this another superb event. don't forget. support it or loose it. thank you. Fantastic news! Thank you Paul. Thats good news Paul, if there's anything I can do to help just ask. Myself and my good lady will be there again - wonderful news. Great news we will be there to support this great event. hi David. thank you. thats very good of you. your efforts already are much appreciated. Paul. I'll put the dates on my calendar now. See you all there. All being well, we will make a long weekend of it again. David Skillern, I hope to have a longer chat with you next time. Will we have the pleasure of your company again Shorty? hope so. I look forward to it and a good chat with everyone else. This is excellent news! I sincerely hope collectors will give it their full support, because that would be the perfect way to pay tribute to all that David Guest did to make it a great event from 2011 onwards. It clearly meant a great deal to David that the weekend should continue, so let's do our best to help make it a great success. If anyone is thinking of writing reasons or excuses why they won't be coming (which I remember David hating) please spare us from reading them. Even if you have to visit your Aunt Mary that day, we don't need to read about it! No excuse at all for UK collectors! Our friend Joe 'Shorty' Caruso ventured to Blackpool all the way from the USA! David told the tale of someone living five minutes away from the venue who said he could not make it! Shopping can be done any day, lawns can be cut any day, but Blackpool only happens once! 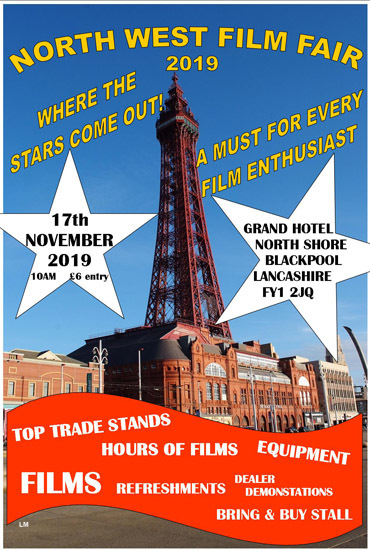 Used to make the trip to Blackpool for David taking a photo for advertising so here is this years effort, anything to forward the film movement. I think David would of been impressed Lee. PS need to pop an R in the Demonstrations bit Lee. That is great news Joe! Nobody from the UK has any excuse not to be there! hi Joe. it would be wonderful if you could visit us again. it was a pleasure having you attend last year. i know David Guest was delighted you made such effort to attend. here's hoping. Paul. It would be fantastic to meet you there, again, Shorty. I will also do my best to attend this year again this wonderful event. Dominique. i think that all those who travel from another country to attend film fairs in the uk are absolutely marvelous. i know you yourself travel to many. inc blackpool. the guys from norway/sweden always attend blackpool.and what a great group they are. it's a pleasure to see everyone.believe me. I Hope one day soon I can go to one of these film shows! I guess I would feel like a kid in a candy shop. A true collectors Dream!